At McWane Ductile, our team members take great pride in the long heritage of quality pipe products made in our facilities over time. McWane Ductile manufactures a variety of ductile iron pipe products that meet and exceed industry specifications and regulations. 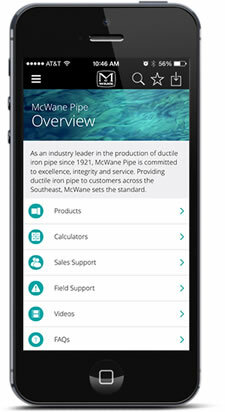 McWane Ductile realizes the importance of providing all necessary product-related information to our customers. To ensure that our customers have all the resources they need, McWane Ductile has specification information, submittal sheets, installation guides, product literature, and much more. Please click on credit application and information for construction jobs to download a copy of the form.